The DP606A and DP612A Series is our newest range of affordable multi-channel panel meters. These models offer increased accuracy, wider operating temperatures and increased flexibility over the CN606 and CN612 models that they replace. The input, power and communications are also now isolated allowing for easier deployment and more reliable operation. The rugged extruded aluminium ¼ DIN case combines with the improved isolation to provide an extremely durable product. These meters can read up to 12 sensors and include RS-232 or RS-485 communications using Modbus®. Two user configurable alarm relays are standard on all models. The universal input allows user selection between Thermocouple (9 Types), RTD 2-Wire, RTD 3-Wire, 4 to 20 mA and 1000 mV input options. These input selections are user set through the front panel buttons or Modbus serial commands. No dip switch setting changes are required. Excellent fit for OEM instrumentation, automotive and aerospace test stand, factory automation, and power generation applications. Note: While the inputs are universal and can be changed via firmware (no dip switches), all 6 or 12 inputs on a given unit must be set to the same type of input for operation. Software: This multi-zone panel meter is most easily configured with Omega Sync, a software tool that enables users to configure device runtime parameters, view process values, and seamlessly export data. 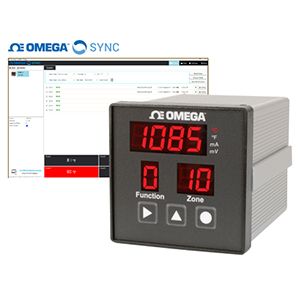 At the moment, Omega Sync supports the CN616A and DP606A/DP612A devices and we look to expand its reach to future products. For long-term data storage, our experts recommend using Omega Enterprise Gateway (OEG) that provides a powerful data historian, alarming, visualization and OPC-UA integration. Nota: While the inputs are universal and can be selected via the user-menu (no dip switches), all 6 or 12 inputs on a given unit must be set to the same type of input.